Major and semi-major banks are being told to obtain secure storage for new currency-dollars. They expect official devaluation by the end of the year. We do not know what the exchange rate will be, but as we have stated previously we expect three old dollars to be traded for one new dollar. The alternative is gold and silver coins and shares. For those with substantial sums that do not want to be in gold and silver related assets completely you can use Canadian and Swiss Treasuries. If you need brokers for these investments we can supply them. The Fed also expects a meltdown in the bond market, especially in municipals. Public services will be cut drastically leading to increased crime and social problems, not to mention the psychological trauma that our country will experience. Already 50% of homes in hard hit urban areas are under water, nationwide more than 25%. That means you have to be out of bonds as well, especially municipals. As you can see, the Illuminist program is going to come quicker than we anticipated. That in part is because they have had to expedite their program, due to exposure in the IF, other publications and especially via talk ratio and the Internet. There is no doubt we have the elitists on the run. We are reaching the masses. On TalkStreamLive.com we were on the Rumor Mill this past week and out of 50 talk radio programs we were 5th behind, Rush, Hannity, Dr. Laura and we were tied with Beck. On the Sovereign Economist on Wednesday night we were 5th behind Beck and Savage and ahead of Hannity. Both these programs are not well known and the Sovereign Economist is only about a month old. It shows you what you can do if you work hard enough at it. The latest favorable events we are told are the seeds of recovery. The green-shoots of spring are to be harvested before winter sets in. We are skeptical of the strength and duration of such a recovery. The underlying problems are still not being addressed. The US government and the Fed cannot bail out banking, Wall Street, insurance and government indefinitely via monetization. Impaired corporations, no matter what their size, have to be allowed to fail. Stimulus cannot be used indefinitely. Both have to be reigned in, because the longer this charade continues the worse the final outcome is going to be. As we predicted six year’s ago, Fannie Mae, Freddie Mac, Ginnie Mae and FHA are the wards of American taxpayers, as is AIG. All their financial conditions worsen every day. They have again been insuring subprime mortgages by the thousands and when they begin to reset next year, we will be back to 60% failure rates. Even government admits already they’ll see 20% failure rates. This, so that housing inventory can be cut from 11-1/2-months inventory to 7-months, again in order to bail out the lenders at the expense of taxpayers. Government and the Fed have no exit plans for these sinking ships, particularly Fannie, Freddie, Ginnie and FHA, never mind their meddling in the economy guaranteeing everything is sight. Benito Mussolini would be very proud of what they have done. Then we have those on Wall Street, banking and corporate America who believe they are doing God’s work by looting the American public making outrageous profits by in part using taxpayer funds, and allotting themselves disgraceful bonuses as unemployment hovers at 22.2%. Haven’t these people heard of the French Revolution? Their arrogance has no bounds. The credit crisis hasn’t ended; the Fed has extended it by throwing money at problems. We have a mortgage market that is worse than it was a year ago, only kept from sinking by a tax credit 3% down. As a result now we have more than $1 trillion of new mortgage failures on the way. Our monetary base has more than doubled. Interest rates will probably stay where they are for 18 months or more and we even have a dollar carry trade. The 2009 fiscal budget deficit was $1.5 trillion and 2010 will be worse. Government is not cutting expenses. They are increasing expenses. In addition making matters worse corruption is flourishing via the incestuous revolving door between Wall Street, the Treasury, in a multiplicity of other appointments and with the Fed. Is it any wonder 75% of Americans want the Fed audited and investigated. That said, the present set of circumstances cannot be allowed to go on indefinitely. We cannot keep insurance, Wall Street and banking on life support forever. Not when we finance two occupations and an ongoing war, never mind our unfunded liabilities of Medicare, Social Security, etc. most all of these problems are being financed by debt to be paid by our great, great grandchildren. We just created $12.7 trillion for bailouts and the Inspector General tells us we are presently on the hook for $23.7 trillion. What happens if all the recipients need another $20 trillion? The situation is still dire and the solution is temporary and unworkable and Washington and New York are well aware of this. The game will play out over the next few years. In the meantime the dollar will move lower and inflation, gold and silver higher. Economics is not complex; it is very simple. Professors and economists would like to have you believe it is complicated when in fact they make it opaque, so you cannot understand it. The same is true with banking. In normal times through the century’s bankers using the fractional banking system usually lent 8 times their assets, or deposits. It was only until recently that the privately owned Federal Reserve told banks within the system to lend 40 times assets or more in order to accommodate the system. All this is to cover to confuse and hide the truth of fractional banking. Bankers’ indebt borrowers with money they made up out of thin air. Debt is enslavement by the bankers upon the people by buying almost everyone off. In the final analysis banking is a fraud unless money is interest free. The Fed, and all the other banks are a fraud. The game as we know it today began in 1694 when the Rothschild’s formed the privately owned Bank of England and the production of bank notes began and circulated along with sterling silver coins. The end result has been that the bankers own the world. The system today is based on confidence and trust, something that has been worn thin. A reflection of the loss of trust and confidence is that 75% to 80% of Americans want HR1207 and S604 passed by Congress, so that the Fed can be audited and investigated. The public no longer trusts the Fed and the banks. As a result the con game may well be coming to an end. Fifty years ago we and a handful of other conservative warriors set out to inform the public of the giant scam that the Fed really was. It has been a long hard road. Gary Allen and Alan Stang are gone and of the originals all that are left are G. Edward Griffin, Stan Monteith, Anthony Hilder and us. During our lifetimes we now probably will see the end of the Fed. Because the people have finally been awakened. It was a long hard battle that may soon come to fruition. The final step will be the termination of the Federal Reserve and its monopoly on financial theft. Unfortunately it will mean the demise of the only financial system we have known for 315 years. We do not know as yet what the new system will be like, but the con game is over and most of the world’s inhabitants are broke. The debt that is owed simply cannot be repaid. Japan, the US, the UK and Europe will be the first to go followed by most of the rest of the world. You ask who will be the big winners? Gold and silver of course. Just as we have been telling you they would for 9-1/2 years, since gold was $252.00 and silver $3.80. Look at the gains for those who listened. And, we still have a long, long way to go to preserve our wealth. Over all those years the gold suppression cartel fought to hold down gold prices by selling gold, using derivatives and futures and in collaboration with good producers such as Barrick Gold and others. Hopefully HR3996 (HR-1207) will now pass unchanged and we can take a look at what the Fed and the Treasury were doing and who aided them. What we are witnessing in the US and world economy is the result of the greed of central banks to make as much money as possible before they have to collapse the system to bring about World Government. Manufacturing activity in the Federal Reserve Bank of Kansas City's district improved in November. The bank's production index for November versus a month ago moved to 17 from 6 in October. In November 2008, it stood at -31, from -40 in the previous month. On a monthly comparison, the November shipments index hit 11 from 1 in October, while on a year ago basis it was -28, from -40. The November new orders index on a monthly basis was 14 versus 11 the prior month, while on a year ago basis it stood at -16 from -37. Hiring was mixed, with the monthly employment index at 2 in November, from 0 the month before, while on a year ago basis it was -49, from -47. U.S. consumer sentiment levels fell in November, a report Wednesday said. The University of Michigan/Reuters final consumer sentiment index moved to 67.4 from 70.6 in October. It was expected to come in at 66.8, and it stood at 66.0 in the preliminary reading. The current conditions index was 68.8, from 73.7 in October, while the final expectations index hit 66.5, from 68.6. Consumers' final one-year inflation expectations forecast was 2.7%, from 2.9% the month before, while the five-year outlook was 3.0%, after 2.9%. New-home sales unexpectedly climbed in October despite bad weather and uncertainty over a big tax credit for first-time buyers. Sales of single-family homes increased 6.2% to a seasonally adjusted annual rate of 430,000, the Commerce Department said Wednesday. Economists surveyed by Dow Jones Newswires estimated a 1.0% drop to a 398,000 annual rate. Some analysts thought the looming expiration of an $8,000 tax credit for homebuyers would scare off buyers in October. New-home sales, unlike sales of existing homes, are recorded with the signing of a sales contract and not the closing. There was also unseasonable cool and wetness in parts of the U.S. last month. The tax credit has since been extended by Congress through April, a move made earlier this month that is seen helping the housing market. Wednesday's report said sales in September fell 2.4% to 405,000. Year over year, sales were up 5.1% since October 2008. The median price for a new home fell in October, but not by much, dropping 0.5% to $212,200. Inventories shrank some more. There were an estimated 239,000 homes for sale at the end of October. That represented a 6.7 months' supply at the current sales rate. An estimated 250,000 homes were for sale at the end of September, a 7.4 months' inventory. Commerce's report Wednesday showed October new-home sales fell in most regions but were up in the South. In a glimmer of hope for the labor market, the number of U.S. workers filing new claims for jobless benefits last week fell to the lowest level since September of 2008. Total claims lasting more than one week, meanwhile, also decreased. Initial claims for jobless benefits declined by 35,000 to 466,000 in the week ended Nov. 21, the Labor Department said in its weekly report Wednesday. The previous week's level was revised to 501,000 from 505,000. This represents the lowest figure for claims since September 13, 2008 and it is the first time initial claims have fallen below the 500,000 mark since early January, according to Labor Department data. Last week's initial claims fell by more than economists expected. Economists surveyed by Dow Jones Newswires had predicted a decrease of 10,000 claims. The four-week moving average of new claims, which aims to smooth volatility in the data, also fell by 16,500 to 496,500 from the previous week's revised average of 513,000. That is the lowest figure since November 8, 2008. Economists widely expected initial claims would fall in Wednesday's report, and some believe that this the break away from the 500,000 mark will be sustained in the weeks to come. "Taken as a whole, the labor market data for the US is suggesting we are in a gradual, steady improvement towards job growth at some point over the next three to six months and the decline in jobless claims is consistent with that," said Zach Pandl, an economist at Nomura Global Economics. "The trend has been very persistent since the end of August and we are expecting that to continue." In the Labor Department's Wednesday report, the number of continuing claims -- those drawn by workers for more than one week in the week ended Nov. 14 -- declined by 190,000 to 5,423,000 from the preceding week's revised level of 5,613,000. The unemployment rate for workers with unemployment insurance for the week ended Nov. 14 was 4.1%, a decrease of a 0.2 percentage point from the prior week's unrevised rate of 4.3%. The largest increase in initial claims for the week ended Nov. 14 was in Florida due to layoffs in the construction, trade, service and manufacturing sectors. The largest decrease in initial claims occurred in California. Spending by Americans bounced back in October as their incomes rose slightly more than expected and inflation remained low, boding well for economic growth in the fourth quarter. Commerce Department data Wednesday showed spending last month rose by 0.7% compared with a September decline of 0.6%, while personal income rose by 0.2% for the second straight month. Meantime, a key gauge of prices that is closely watched by the U.S. Federal Reserve to set monetary policy reiterated inflation wasn't a threat as the economy recovers slowly. The core price index for personal consumption expenditures, which excludes volatile food and energy, rose a monthly 0.2% in October and by 1.4% year-on-year. Economists surveyed by Dow Jones Newswires had forecast consumer spending would rise by 0.6% in October while income would increase by 0.1%. The core PCE index was seen rising by a monthly 0.1%. The U.S. economy's rebound was softer than originally thought in the third quarter, the government said Tuesday in a revision to its gross domestic product estimate which showed less consumer spending than initially estimated. U.S. GDP - the broadest measure of output of goods and services - grew at a 2.8% annual rate during the July to September period, less than the 3.5% rate calculated by the Commerce Department a month ago. Consumer spending, which accounts for 70% of U.S. economic output, increased at a 2.9% annual rate during the third quarter - less than the 3.4% estimated previously. Wednesday's report was an encouraging sign for growth in the fourth quarter, since both consumer spending and incomes rose by more than expected in October. Economists currently expect slightly better economic growth in the fourth quarter compared to the previous three months. One prominent forecaster, Macroeconomic Advisers, predicts GDP growth of 3.1%. Personal income data for the previous months was revised up slightly. It rose by 0.2% in September and by 0.3% in August, the report showed, compared to previous estimates of a flat reading in September and a 0.1% increase the previous month. Still, with more than 10% of the U.S. labor force out of work, the rise in incomes remains moderate. Federal Reserve officials earlier this month raised their expectations for growth this year and in 2010, but predicted the recovery will be so slow that unemployment will remain high and inflation low until the end of next year. As for price gauges in Wednesday's report, the price index for personal consumption expenditures excluding food and energy, year over year, rose 1.4%. The year-over-year gain in September was 1.3%. The Fed watches this core PCE index closely for signs of inflation pressures. Fed officials see core inflation around 1.45% in 2009, 1.25% in 2010, and 1.3% in 2011. On a monthly basis, Wednesday's report showed the core PCE index increased 0.2% in October compared to a 0.1% increase in September. The PCE price index including food and energy prices rose 0.3% in October compared to September. It rose a monthly 0.1% in September. Year over year, the PCE price index was up 0.2% in October after falling 0.6% in September. Demand for long-lasting goods unexpectedly fell in October, brought down by the defense sector, and a barometer of capital spending by businesses tumbled in another sign of the recovery's sluggishness. Manufacturers' orders for durable goods decreased 0.6% to a seasonally adjusted $166.17 billion, the Commerce Department said Wednesday. Military goods demand plunged. Excluding defense, all other durables increased by 0.4% in October, after going 1.8% higher in September. Still, if not for a jump in commercial airpline bookings, the drop in overall durables would have been much greater. While generally negative, the report Wednesday had a few bright spots. September durables were revised way up, for instance. A key number in the monthly data, orders for non-defense capital goods excluding aircraft, fell, by 2.9%, after increasing 2.6% in September. The orders are seen as a proxy for capital spending by businesses. While the economy stopped shrinking last summer, the recovery is expected to be slow, because unemployment has topped 10%. Last week, the government said U.S. home construction fell sharply in October, an unexpected drop that erased months of gains. Economists surveyed by Dow Jones Newswires had projected overall durable goods orders would climb 0.5% in October. Some manufacturers have boosted orders to slow their inventory liquidation and rebuild depleted stockpiles of goods. The Wednesday data showed manufacturers' inventories of durable goods were unchanged in October, ending a string of declines. The last three reports on the sector by the influential research group the Institute for Supply Management have showed manufacturing expanding. Cars, radios, and coffee makers are durables, goods meant to last at least three years. Coming out of the severe recession, durables year to date were down 23%, in unadjusted terms, from the same 10-month period in 2008. Overall durables in September rose 2.0%, adjusted from a previously revised 1.4% increase. US Airways (LCC) said this week it plans to defer the delivery of 54 Airbus jets, in a bid to improve liquidity and ease its strained finances. The deferral will reduce the company's aircraft capital expenditure by about $2.5 billion over the next three years. The economy has hurt airline revenues. A sign within Wednesday's data of future demand for durables, unfilled manufacturers' orders, fell, by 0.4%, the 13th drop in a row. Durable-goods shipments of manufacturers fell 0.2% last month. Orders for transportation-related goods climbed 1.5%, pushed by a 50.8% jump in non-defense planes. Motor vehicle orders dipped 0.1%, despite the success of the government's incentive program "cash for clunkers" last summer. Excluding the transportation sector, orders for all other durables decreased 1.3% in October. Demand ex-transportation had climbed 1.8% in September. Orders last month for metals and electrical equipment rose. Computers and machinery fell. October capital goods orders decreased 2.0%. Non-defense capital goods - items meant to last 10 years or longer - rose 1.2%. Defense-related capital goods orders went down by 18.4%. MBA Mortgage Applications decline by 4.5% in Nov. 20 week. Negative interest rates are back. Yields on short-term US government debt have fallen into negative territory as banks and investors park their cash in havens before the end of the year. Q3 GDP clearly demonstrates that US bean-counters are manufacturing unreasonable economic data. First, the initial 3.5% gain was reduced to 2.8%. But the revised Q3 GDP is hokey because it ‘estimates’ that ‘real gross domestic purchases’ increased 3.5%. This is preposterous given the huge declines in sales taxes that have been reported nationally! Q3 GDP would have been revised even lower if not for the .25 decline in the GDP price adjustment. We have moaned about the understating of inflation in order to overstate economic (GDP) strength for years. And then there is the bogus jobs and income that inflates GDP. Given the decline in income taxes according to federal, state and municipal taxing agencies, how did income increase in Q3? Real government spending increased 8.3%... Auto production, due to ‘Cash for Clunkers’, contributed 1.45 to GDP…GDI increased 2.0%. The price index for gross domestic purchases, which measures prices paid by U.S. residents, increased 1.4 percent in the third quarter, 0.2 percentage point less than in the advance estimate; this index increased 0.5 percent in the second quarter. Excluding food and energy prices, the price index for gross domestic purchases increased 0.4 percent in the third quarter, compared with an increase of 0.8 percent in the second. Here’s something else from the GDP report that caught our eye: Profits from current production (corporate profits with inventory valuation and capital consumption adjustments) increased $130.0 billion in the third quarter, compared with an increase of $43.8 billion in the second quarter. Taxes on corporate income increased $6.7 billion in the third quarter, compared with an increase of $35.6 billion in the second. How do profits increase $130B while taxes only increase $6.7B? In the first three quarters of 2009, profits at financial institutions soared 198 percent, the biggest nine- month gain since records began in 1948. Earnings were down 65 percent in the nine months ended in December 2008, the biggest such decrease on record. A House bill still being drafted aims to raise $150 billion each year to pay for new jobs. Under a bill being drafted by Democratic Reps. Peter DeFazio (Ore.) and Ed Perlmutter (Colo.), the sale and purchase of financial instruments such as stocks, options, derivatives and futures would face a 0.25 percent tax. Banks have spent the past year dealing with a mountain of bad assets. Now attention is turning to trillions of dollars of debt they have maturing over the next few years. Banks unable to maneuver around the challenge could be forced to refinance their debt at sharply higher costs. Citigroup has about $30 billion in 2010 of debt coming due next year, with an additional $39.5 billion in 2011 and $59.3 billion in 2012. 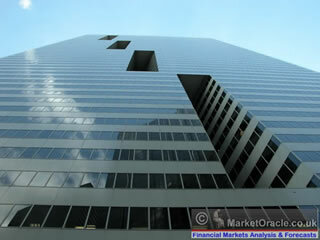 Bank of America must deal with debts totaling about $55.4 billion in 2010, $35.3 billion in 2011 and $58.4 billion in 2012. J.P. Morgan Chase & Co. faces about $130 billion maturing through 2012. Rising borrowing costs for banks could spill into the broader economy at a time when consumer and corporate borrowers already are under stress. Banks could pass on the costs in the form of higher interest rates. The Rasmussen Reports daily Presidential Tracking Poll for Tuesday shows that 27% of the nation's voters Strongly Approve of the way that Barack Obama is performing his role as President. Forty-two percent (42%) Strongly Disapprove giving Obama a Presidential Approval Index rating of -15. This is the lowest Approval Index rating yet measured for President Obama. Democrats approve as do 33% of unaffiliated voters. Eighty-three percent (83%) of Republicans disapprove. Among all voters, 54% now disapprove. Support for the health care plan proposed by the President and Congressional Democrats has fallen to a new low of 38%. Sixty percent (60%) of voters believe passage of the bill will lead to higher health care costs. http://www.rasmussenreports.com/..
U.S. banks are earning money again, but they're writing fewer business loans, threatening a fragile economic recovery. The Federal Deposit Insurance Corp. reported Tuesday that U.S. bank loans fell by $210.4 billion or 2.8% during the third quarter – the biggest drop since the FDIC started keeping records in 1984. Banks booked $2.8 billion in third-quarter profits, reversing a second-quarter loss of $4.3 billion. "We need to see banks making more loans to their business customers," says FDIC Chairman Sheila Bair. "This is especially true for small businesses." Loans to businesses fell 6.5%, and real estate loans plummeted 8.1%. "Until small businesses are able to borrow, we can't have a robust economy, because that's your largest source of jobs," says Richard Posner, a law professor at the University of Chicago and a federal circuit judge. The Small Business Administration has said that small businesses created 64% of new jobs in the past 15 years. Banks are reluctant to make new loans until they've cleared off the bad ones they made during the housing boom. Back then, they paid "insufficient attention to certain kinds of risky loans," says Edward Kane, finance professor at Boston College. "You can't expect them to turn around and turn the lending machine back on." Non-current loans rose more than 10% during the quarter to $366.6 billion or nearly 5% of all loans, the highest rate on record. Banks charged off nearly $51 billion in bad loans last quarter, the 11th straight quarterly increase and up more than 80% from a year earlier. "Loan losses will continue to climb as long as foreclosures keep rising and homeowners, builders and developers continue to hurt," says Kate Monahan, banking analyst at Aite Group. Banks don't expect things to get better anytime soon: Two out of three banks set aside more reserves for losses during the quarter, reserving a total of $62.5 billion, 22% higher than last year. Banks are hoarding money in super-safe Treasury securities, and, "Businesses were not as eager to take on debt," says FDIC chief economist Richard Brown. Increasing bank failures are feeding the worries: 124 banks have failed this year, up from 25 in all of 2008, draining the FDIC's deposit insurance fund, which fell below zero (to minus $8.2 billion) in the third quarter. But the FDIC had earlier set aside $38.9 billion to cover losses, giving it total reserves of $30.7 billion to protect depositors in failed banks. The FDIC has another $23.3 billion in cash. The agency expects to collect another $45 billion at the end of the year when banks pay three years of deposit insurance premiums in advance. Bair warns not to read too much into one quarter's results, noting that banks won't return to full health until the economy improves. "It really is all about the economy at this point," she says. "I don't want to make any predictions." The International Monetary Fund said it will have access to a credit line of up to $600 billion to make loans during financial crises after contributing countries agreed to fold commitments into one pool. Connecticut plans to join Ohio in suing credit-rating companies for “negligent, reckless and incompetent work” in grading debt purchased by state pension funds, according to Attorney General Richard Blumenthal. Connecticut and “a number of other states” are preparing legal action against Standard & Poor’s, Moody’s Corp. and Fitch Ratings, Blumenthal said today in a Bloomberg Television interview. Ohio Attorney General Richard Cordray sued the debt raters this month on behalf of five Ohio public employee retirement funds, saying “improper” ratings cost the funds more than $457 million. The state actions come amid criticism of the ratings services by investors and lawmakers including Senate Banking Committee Chairman Christopher Dodd, who has said the companies wrongly assigned top credit rankings to U.S. subprime-mortgage bonds just before that market collapsed in 2007. Defaults on the debt ignited a credit crisis that has led to more than $1.7 trillion in writedowns and losses since the start of 2007. Blumenthal also sued the credit-rating companies last year, saying they unfairly gave municipal bonds lower ratings than comparable corporate or structured debt. Dubai World, with $59 billion of liabilities, is seeking to delay debt payments, sending contracts to protect the emirate against default surging by the most since they began trading in January. The state-controlled company will ask all creditors for a “standstill” agreement as it negotiates to extend maturities, including $3.52 billion of Islamic bonds due on Dec. 14 from its property unit Nakheel PJSC, the builder of palm tree-shaped islands, Dubai’s Department of Finance said in an e-mailed statement. Moody’s Investors Service said it would consider the plan a default should bondholders be forced to accept the terms. "The bank was so intransigent that he [the judge] decided to punish them," Greg Horoski, 55, said about Spinner's scathing ruling last Thursday against OneWest and its IndyMac mortgage division. The Horoskis -- who had been paying only interest on their mortgage -- had no equity in the home. Horoski, who had begged the bankers to let him restructure the loan, said, "I think the judge felt it was almost a personal vendetta." Dealing with the bank, he said, was "like dealing with organized crime." OneWest said, "We respectfully disagree with the lower court's unprecedented ruling and we expect that it will be overturned on appeal." It claimed it "has been extremely active in working with consumers on home loan modifications through the Obama administration's Home Affordable Modification Program and other loan modification initiatives." It eventually ended up being either owned or serviced by IndyMac, and the bank sued the couple in July 2005 when they began having trouble making payments because of Horoski's health problems. Rates for 30-year fixed U.S. home loans fell for a fourth straight week, matching a record low of 4.78 percent set in April. The rate dropped from 4.83 percent last week, mortgage buyer Freddie Mac of McLean, Virginia, said today in a statement. The average 15-year rate was 4.29 percent. Low mortgage costs and a tax credit for first-time homebuyers helped increase demand for property, putting existing home sales on pace to hit 6.1 million this year. Reduced inventory of unsold homes is beginning to stabilize prices. The S&P/Case-Shiller home-price index rose 0.27 percent in September from August, the fourth consecutive month-to-month gain. Federal Reserve bond purchases from Fannie Mae, Freddie Mac and Ginnie Mae, which package home loans into securities, brought yields on the bonds down, allowing lenders to reduce rates on new loans while still selling the securities backed by them at a profit. The central bank pledged to buy up to $1.25 trillion in mortgage-backed securities in a program scheduled to end the first quarter of next year. Yields on Fannie Mae and Freddie Mac mortgage securities fell to the lowest in more than six months yesterday. Fed officials have agreed to gradually slow the central banks buying to promote a smooth transition in markets as the announced purchases are completed, according to minutes of their Nov. 3-4 meeting released yesterday. President Barack Obama signed legislation this month to extend and expand a home buying tax credit, which may further boost property sales. The tax credit for first-time buyers was set to expire Nov. 30 and may have sparked an increase in existing home sales in October. Purchases of existing homes rose 10.1 percent to the highest level since February 2007. Spending by U.S. consumers rebounded in October more than anticipated, an indication that mounting unemployment has yet to stifle Americans willingness to buy. The 0.7 percent increase in purchases was larger than the median estimate of economists surveyed by Bloomberg News and followed a 0.6 percent September drop, Commerce Department figures showed today in Washington. Incomes climbed 0.2 percent, also exceeding expectations. Not since Henry Kissinger fled a team of LaRouche organizers, in the back of a delivery truck in New York City's Central Park in the early 1980s, has an obese fascist moved so fast to escape an angry crowd, as Al Gore did today in Chicago. Appearing at a bookstore in the downtown Loop, Gore was confronted by a team of demonstrators from a grass roots group called "We Are Change," as he was signing his latest fascist screed on the global warming swindle. Gore bolted from the bookstore, raced down an alley, jumped into a waiting car, and tried to speed off, with protesters chasing after him and banging on the car. Midwest LYM organizers, who were also on the scene to confront the global warming swindler, provided an eyewitness account of Fat Albert's flight of fear. Make no mistake about it. This little encounter is typical of the kinds of things going on all over the country, as the fascists who brought you the near-destruction of the United States and an onrushing global Dark Age, are no longer walking the streets, smug in the belief that they are literally getting away with murder. The mass strike dynamic is playing out in thousands of ways, every day, and the recent revelations about the "smoking gun" emails from the East Anglia University global warming propaganda center, have made Al Gore's life a little more miserable. As Percy Shelley wrote in "The Mask of Anarchy," "We are many, they are few." U.S. building permits for October were revised to down 4.2% from September to a seasonally adjusted rate of 551,000, the Commerce Department reported Wednesday. October building permits were originally reported as being down 4.0% at a seasonally adjusted rate of 552,000. The Federal Reserve's latest weekly money supply report Friday shows seasonally adjusted M1 fell by $27.5 billion to $1.691 trillion, while M2 rose $2.7 billion to $8.392 trillion. “One cannot rule out -- as a tail risk -- a case where this would escalate into a major sovereign default problem, which would then resonate across global emerging markets in the same way that Argentina did in the early 2000s or Russia in the late 1990s,” Bank of America strategists Benoit Anne and Daniel Tenengauzer wrote in a report. Average rates for 30-year fixed mortgages fell this week, matching a record low set last spring and more than a full percentage point below what they were a year ago, Freddie Mac said Wednesday. Rates for 30-year mortgages averaged 4.78 percent this week, down from 4.83 percent last week and equaling the record low reached the week of April 30. Freddie Mac has been tracking rates on 30-year fixed mortgages since 1971. Last year at this time, the 30-year fixed rate mortgage averaged 5.97 percent. Interest rates began dropping last November, when the Federal Reserve began spending $1.25 trillion to buy up mortgage-backed securities in an effort to lower rates, loosen credit availability and bolster the long-suffering housing market. Since April, rates have hovered near 5 percent, spurring refinance activity. However, credit standards remain stringent, so the best rates usually are available only to borrowers with solid credit and a 20 percent down payment. Rates for 30-year fixed mortgages are now 0.8 percentage points below this year's peak set in mid-June. Refinancing at the current rate shaves roughly $100 off monthly payments on a $200,000 mortgage, said Frank Nothaft, Freddie Mac's chief economist. Freddie Mac collects mortgage rates on Monday through Wednesday of each week from lenders around the country. Rates often fluctuate significantly, even within a given day, frequently in line with long-term Treasury bonds. The average rate on a 15-year fixed-rate mortgage fell to 4.29 percent, down from 4.32 percent last week, according to Freddie Mac. The 15-year rate hasn't been this low since Freddie Mac started tracking it in 1991. Rates on five-year, adjustable-rate mortgages averaged 4.18 percent, down from last week's 4.25 percent. Rates on one-year, adjustable-rate mortgages were 4.35 percent for the second consecutive week. The rates do not include add-on fees known as points. The nationwide fee for loans in Freddie Mac's survey averaged 0.7 point for 30-year and one-year loans. The fee averaged 0.6 point for 15-year and five-year mortgages. Commercial paper contracted for the third week in four, falling $10.7 billion to $1.257 trillion. We should remind you that the runs in stocks and bonds have been almost completely driven by liquidity. Now with Dubai’s sovereign debt problems more liquidity could be lost and these markets could be in deep trouble. "We do not know what the exchange rate will be, but as we have stated previously we expect three old dollars to be traded for one new dollar." Don't you expect that the government will confiscate gold or pay $252.00 in new dollars?